The two of the most important processes in the evolution of our Universe are star-formation and accretion. These two symbiotic processes shape the evolution galaxies and what we observe in the Universe today. A composite optical image of the polar ring galaxy NGC 660 (Gemini Observatory/AURA). How star-formation and accretion interact and affect how galaxies evolve in both the local and distant Universe remains a critical open question in astrophysics. At JBCA our research focuses on using observations across all wavelengths to understand the astrophysical role of star-formation and accretion processes in galaxies from the local to the distant high redshift Universe. Studies of objects and processes in our own galaxy can tell us a lot about the formation and evolution of stars across the mass spectrum. But studying our galaxy as a whole is ham­pered by the fact that the solar system sits within the disc; probing the structure of the Milky Way from this vantage point is not straightforward. Looking further out into the Universe, the high resolution and sensitivity of telescopes such as e-MERLIN, EVN, ALMA, NOEMA, VLA, Chandra, HST, Herschel and alike can be used to learn much about the detailed structure of galaxies, knowledge which can then be applied to the study of galaxies at much greater distances, as well as to help to determine the evolution and history of our own Milky Way. The emission observed from galaxies in both the local and distant Universe is domi­nated by the processes of star formation and accretion – both fundamental to the formation and evolution of galaxies. Accre­tion sources, such as active galactic nuclei (AGN), provide a major power source in the universe and can dominate the emis­sion in objects from distant quasars down to nearby compact stellar mass accretion sources such as X-ray binaries, whereas star formation is a ubiquitous process in all galaxies that enriches the ISM of galaxies. Feedback from – and between – each of these processes is crucial to our under­standing of galaxy evolution and appears to be essential if the observed galaxy luminosity function is to be reconciled with predictions from the standard hierarchi­cal clustering models. 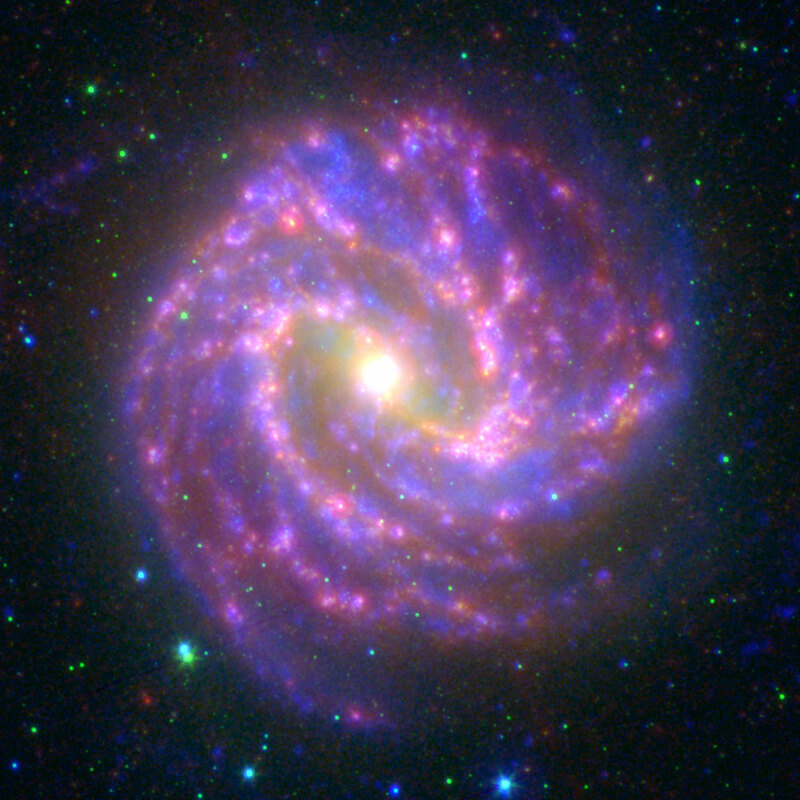 A multicolour image of M83. The blue colour traces ultraviolet light from hot stars. The green colour traces the near-infrared light of older stars and the red colour traces interstellar dust found near the sites of star-formation. Credit: Bendo et al 2012). In nearby galaxies, it is possible to examine the large scale structures where stars are forming. The JBCA investigates star formation using data from multiple wavelengths. Staff at the JBCA take advantage of e-MERLIN as well as the close ties with ALMA and SKA to study multiple aspects of star formation at radio and millimetre wavelengths. These radio telescopes can be used to look for free-free continuum and hydrogen line emission from gas photoionized by the hot blue stars found within these star forming regions as well as the diffuse synchrotron continuum emission from the electrons ejected when those hot blue stars become supernovae. At high angular resolutions, it is possible to identify individual supernovae themselves. These radio data can be combined with images of the ultraviolet light from the hot blue stars, the optical images of the photoionized hydrogen gas around these stars, and the infrared images of the interstellar dust found around the star forming sites to build up a complete picture of how star formation works. First stars. A simulation of the Population III protostellar system. The protostars form so close together because of the high temperatures and densities involved that they can grow through merging. The environment in which a star forms will also affect the end product. For instance gas, which does not contain metals will be less able to cool as its density increases making it harder to form stars. The first stars to form after the big bang would not contain any metals and as a result may have a different mass distribution. Through the some of the deepest observations ever made of the distant Universe, JBCA scientists are investigating the role of, and interplay between, star-formation and accretion within galaxies across all redshifts. 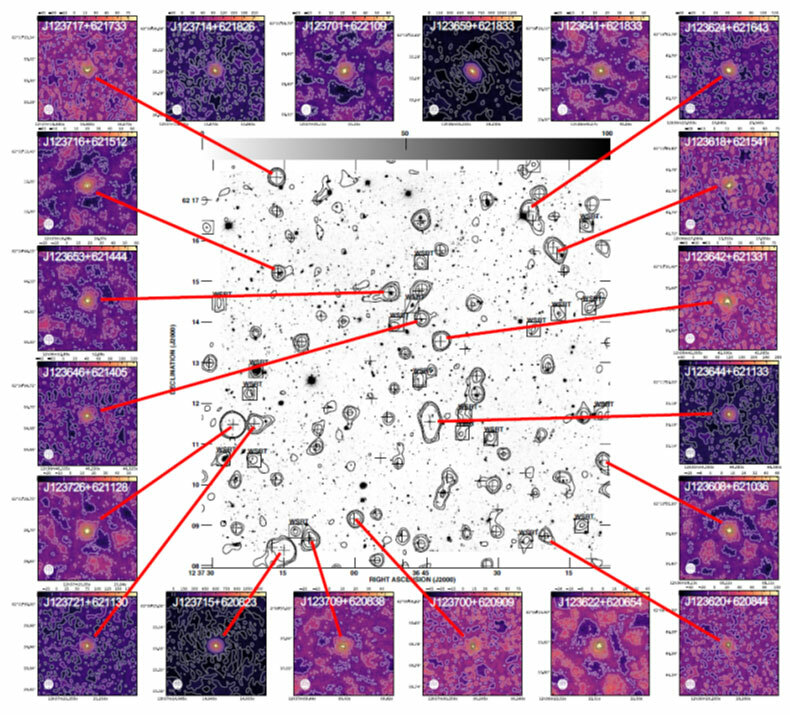 Large legacy programmes utilizing e-MERLIN and other state-of-the-art telescopes across all wavebands are being used to build up sensitive and high resolution images of galaxies. These radio observations will provide a powerful, obscuration-independent tool for measuring the massive star formation and AGN activity in high-redshift galaxies, hence tracing the development of the stellar populations and the black hole growth in the first massive galaxies. With a resolution of 50-200 mas in C- and L-Bands, corresponding to < 0.5-1.5kpc at z > 1, e-MERLIN gives us our first truly reliable view of the distribution of star-formation within typical galaxies at the epoch where the bulk of the stars in the present-day Universe were being formed. These high resolution studies are disentangling the relative contributions of AGN and star-formation, an essential step given the apparently simultaneous growth of the black holes and stellar populations in galaxies. Radio emission from a distant, faint extended radio starburst sub-mm galaxy at redshift 1.76 in GOODS-N. Background image HST WFC3 [IR F160W] (credit : e-MERGE/e-MERLIN Legacy – Muxlow). Compendium of radio sources detected with milliarcsecond resolution VLBI within the GOODS-N region. Active Galactic Nuclei (AGN) are some of the most compact and energetic objects in the Universe. They are created when the supermassive black hole at the centre of a galaxy accretes matter. They are often accompanied by the emission of accelerated particles in the form of jets. One of the key questions still to be answered is how does the interplay between AGN activity and star-formation evolve through cosmic time? To achieve this, we need to use a technique that can, in principle, detect all AGN. At many wavelengths, AGN are often be obscured by dust. For example, in the X-ray regime, a large proportion of Compton thick AGN (thought to make up a sizeable AGN population) cannot be detected. However, high resolution (milliarcsecond) radio observations, and in particular Very Long Baseline Interferometry (VLBI), provides a dust-independent method for detecting bright, compact objects, such as AGN, to redshifts of ~3. Ultra-sensitive wide-field VLBI survey, targeting the Hubble Deep Field-North (HDF-N), has recently been conducted. It is one of the biggest VLBI projects ever undertaken by the European VLBI Network, involving some 699 targets which reach microJy rms sensitivities. From the first epoch of data, eight new AGN have been discovered, taking the total in the field to 20. This is the biggest population of microJy AGN to date and work is ongoing to infer the interplay between star formation and AGN at high redshifts. Within the dusty hearts nearby galaxies with high rates of star-formation numerous supernovae and supernova remnants exist. At optical wavelengths these sources are often completely obscured for view by dust gas, however they at radio wavelengths they become a signpost for some of the most massive star-formation within the Universe, and a probe high mass star-formation and the interstellar and circumstellar medium within galaxies. JBCA leads a number of long-running programmes both searching for new radio supernovae and tracking the evolution of and expansion of existing sources. e-MERLIN images at 1.4GHz (RHS) and 5GHz (LHS) of a number of faint radio supernova and HII regions within the heart of M82. These represent just a few of the more than 100 compact radio sources in this galaxy. 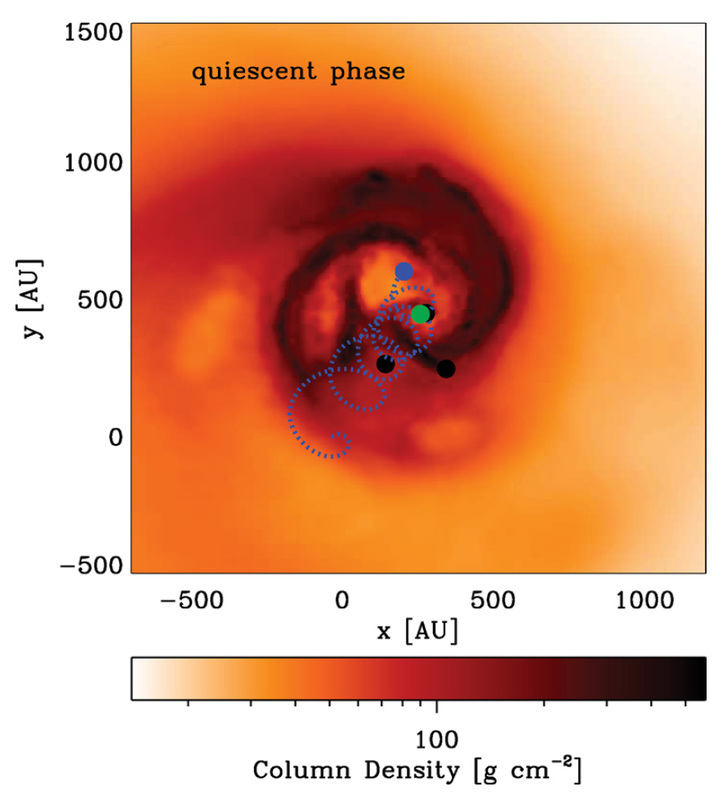 Flaring Black Hole Accretion Disk in the Binary System V404 Cygni.